Very excited today, as my self-imposed “launch date” has arrived! The official launch of my efforts to build a better mousetrap–in this case a production lighting instrument. Two years of development, applying for a patent, 3D printing prototypes. Making mistakes, do-overs, learning new skills……and I’m ready! 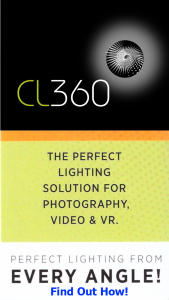 Introducing the “CL360,” a specialized lighting instrument for the emerging markets of 360 degree video, photography and VR/AR production. What has been absent in this new world of 360 content is an easy and efficient way to light the entire scene. Lighting either has to be hidden in plain sight, just expected that it will be seen, or simply not dealt with, using only ambient lighting. My creation solves this problem by providing an even light source that illuminates the full view of the 360 camera, while being “invisible” to it. Accomplished by a now Patent Pending design. The design allows for quick setup suitable for many applications such as video conferencing, interviews, documentaries, real estate, etc. Tom, So anxious to see the video, the gang (Our Doylestown Jam) has been making me nuts asking when the video will be ready…. Can’t wait to see it. All the best to you.